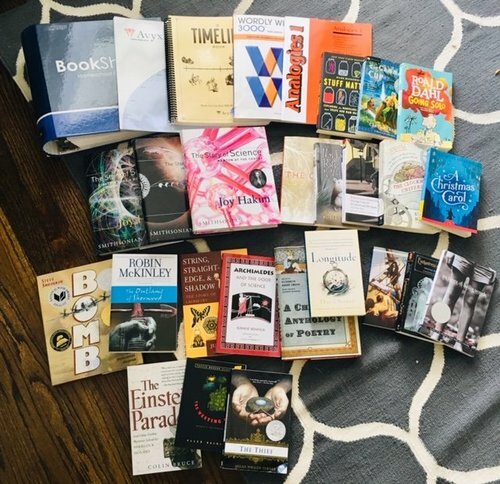 BookShark Level 8 History & Literature, plus extras. Excellent condition. What's included: History: Archimedes and the Door of Science (JH10) The Story of Science: Aristotle Leads the Way (JH01) Bomb (JH08) The Story of Science: Einstein Adds a New Dimension (JH03) The Story of Science: Newton at the Center (JH02) The Clockwork Universe (JH05) The Einstein Paradox (JH06) Stuff Matters (JH09) Longitude (JH07) String, Straightedge, & Shadow (JH04) History 8 Instructor's Guide │Ages 13-15 (JCB) (Has light markings in it, mostly pencil) Literature & Language Arts: The Giver (JR03) The Westing Game (JR02) The Thief (JR01) Going Solo (230-30) The Gammage Cup (230-28) Strange Case of Dr. Jekyll and Mr. Hyde - and Other Tales (230-24) The Outlaws of Sherwood (230-02) Treasure Island (230-68) Mrs. Frisby and the Rats of NIMH (230-44) A Christmas Carol (230-22) Pictures of Hollis Woods (230-51) Enchantress from the Stars (230-25) Classic Literature & Language Arts 8 Instructor's Guide (8LB) (Has light markings in it, mostly pencil) A Child's Anthology of Poetry (230-11) EXTRAS: Large BookShark binder with tabs Analogies 1 Wordly Wise 3000 book 8 (has some writing in it) Timeline book (has some writing) Markable World Map Payment through PayPal. Shipping included via Media Mail to continental US only.